Subject Line: Get Double Points Tomorrow on #NoWaitWednesday! 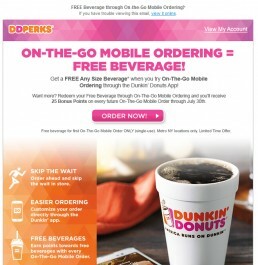 Creative Review: Another from the DD Perks series, nice integrated campaign that tied together ordering via their mobile app and hash tag for social. They supported the cross channel effort with posts each week as well to drive orders via the app with extra points and special offers. During the year they also sent different points level, this one has 2x points, but I also received others that were 3x points as well. 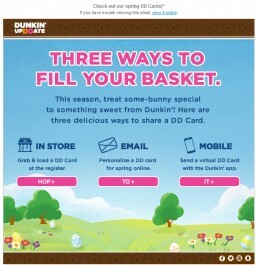 If they tied it to the slowest day of the week to drive more foot traffic, even better! 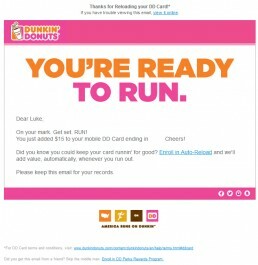 Plus, I assume that the different point rewards were testing, creating a data driven campaign. Overall, well-done loyalty driver to get people to order more often.